44 N Van Buren St. 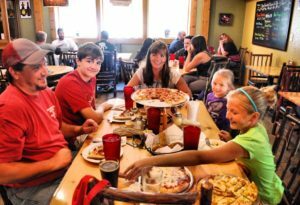 Necessity is the mother of invention — and Big Woods Pizza Co.
Not long after the original Big Woods brew pub opened, we quickly realized we needed a few things — namely, more room to make and store beer, more seats, and a place for guests to bring the whole family. We found our solution just across the alley in 2011, and Big Woods Pizza Co. was born! 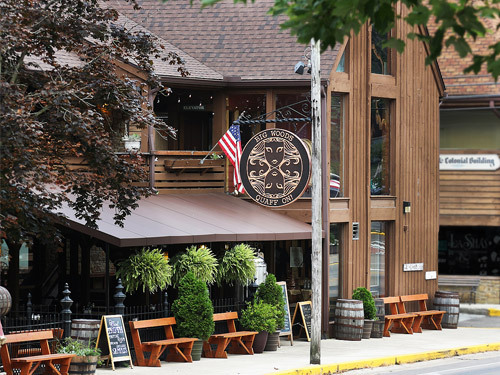 Today, our only pizza restaurant boasts outdoor and indoor family seating, a downstairs bar and tasting room, and a second floor bar and event space. It also shares its Van Buren St. building with sister brand Hard Truth Distilling Co., which moved in shortly after the brewery moved up the road. Big Woods Pizza Co. currently offers specialty and build-your own pizzas and calzones, breadsticks, sandwiches, salads, and a kids’ menu. We also feature a broad selection of Quaff ON! Brewing Co. ales and Hard Truth spirits. Need some Big Woods, Quaff ON!, and Hard Truth swag? Visit the tasting room for our broadest in-house selection of goods that includes everything from t-shirts and glasses to locally-made leather goods and specialty growlers to bottles of Hard Truth spirits.